Given such gusts, coaches tend to twist their manuals in search of satisfactory solutions. In Vitoria, he explored two new ways. First, he loaded the center of the field with cement. He had neither Campaña nor Rochina , but Bardhi , who nevertheless relegated to the bench. The other major modification was system. He abandoned the 5-3-2 that has given him so many joys since he reached the Levante bench to move to a 4-4-2. Al Alavés was surprised in the first minutes by this novel disposition, since in the list of incumbents it was intuited that he would continue playing with five back. Abelardo also had bet with a variant that reserves for large parties, with three midfielders together, but that was very clear since the starting eleven was known. 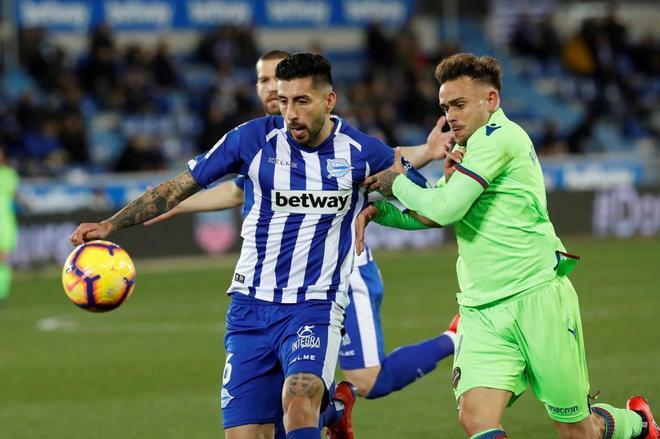 Between some things and others, the start was strange, in a Mendizorroza again half-empty until the minute 5, giving continuity to the protest that already led the albiazul fans the last Monday that Alavés had played at home. The only difference with that day was that this time the relay of Gol did not try to hide crudely the blue seats without occupying . Neither reported the protest, but it is an advance. The fact is that the party was stupid, with one and another team barking but without getting to bite until Calleri , after the quarter of an hour, sent a header to the crossbar. In the rejection, Inui warned his new fans that they can demand many things in the field, but that the goal is not among its virtues. The local warning was made shortly after, taking advantage of the fragility of Levante in the passing game. Laguardia prolonged his imperial season by nodding at the far post a corner kick to overtake Abelardo's team and plunge Levante into nervousness. Especially Aitor Fernández , whose mistake in picking up a single center almost caused Calleri to score the second of the premises.